When it comes it describing an attractive character, “show don’t tell” is crucial. But how do you describe the love interest without just repeating “she was beautiful” or “he was drop-dead gorgeous”? Just like any kind of writing exposition, good description can make or break the introduction of a stunning new character. Never fear! Here are six ways to write about a good-looking guy or gal in your book without being boring, repetitive, or flat. As with writing kissing scenes, physicality is, if not everything, then a lot of things. Instead of focusing on the purely visual aspects of an attractive character, focus on how their appearance affects the other characters. Stomach butterflies? Racing heart? Rising temperatures? Don’t hold back. 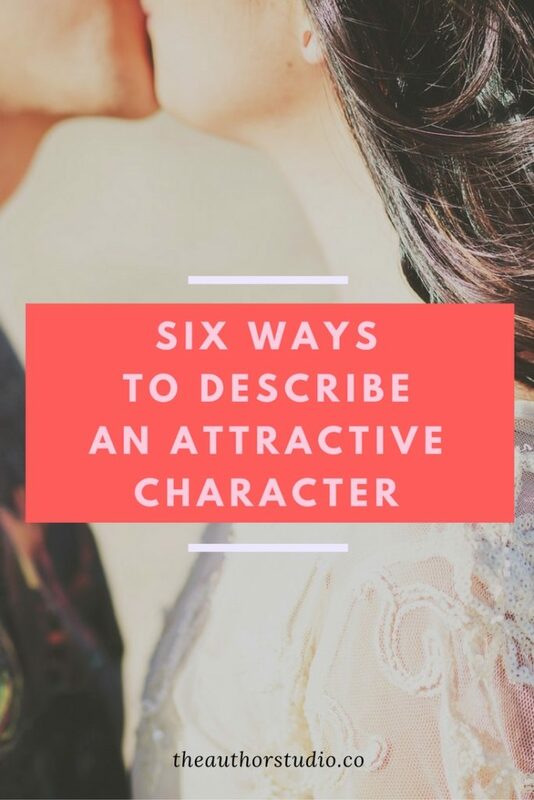 Another classic romance writing tip—but applying all five senses specifically to appearance of an attractive character is absolutely crucial. Don’t just focus on the visuals; consider how the person smells, sounds like when they talk, and feels (if your POV character is lucky enough to touch them, anyway!). Don’t go crazy with adjectives. Too many descriptors can make your character sound like a laundry list of features rather than an actual human being (or wolf shifter, or vampire, or whatever). A hero with “sapphire eyes” and “bronzed caramel skin” ends up being more distracting than specific to the reader—the ten-dollar words aren’t adding anything, and in a pile-up, can read as clumsy and amateurish. All that said, it is actually okay to “tell” what the attractive character looks like—as long as it’s grounded in the voice of the narrator. Using the turns of phrase that your narrator is accustomed to in writing about an attractive character does double duty, because it not only conveys information about the character being described, but also the worldview and particular attitudes about the narrator. You know this, of course! But in romance and YA romance in particular, readers want writers to know how avoid clichés in their writing. Clichés make books feel generic, and make readers skim—which is the opposite of what you want! The only real way to avoid clichés is to know what they are in the first place, and the only way to know that is to read widely in your genre. It’s a fine line between delivering on genre expectations and settling too heavily into cliché, but the more you know about the other books in your category, the better you’ll be able to make your writing stand out. Dialogue is a big part of showing off a character’s magnetic appeal. But it’s human nature that people don’t mean what they say or say what they mean. (Seriously, when was the last time you just walked up to someone and said “hey, you’re hot!”?) When your character is talking to someone they find attractive, what they talk about isn’t as important as the way they say it. Too much talking about mutual attraction outright is a sure way to kill tension. Amp up the mystery and sensuality by cloaking their real intentions—even a discussion over something as simple as grocery shopping can become electrically charged when attraction is at a fever pitch.